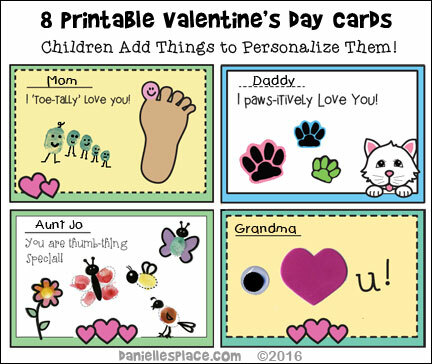 These toe-tally awesome Valentine's Day crafts are great for children of all ages from preschool to high school! 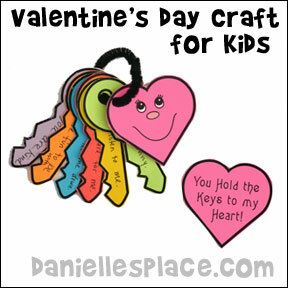 This craft can be used for Valentine's Day, Mother's, Father's Day, or for birthdays! Six-Strand Floss - Used for embroidery, any colors will do, or use colors to match your hair and your loved one's hair. 1. Make the toe wigs using embroidery floss. Wind the floss around a one-inch ruler or something similar about 10 times. Use another piece of floss to tie the strands together while it is still on the ruler. Pull the floss off the ruler and cut through all the strands at the opposite end of where you tied the floss. 2. To make the bow draw a bow shape on some craft foam or use a very thin piece of ribbon to tie a bow..
3. Draw faces on your two big toes, or find someone to do it for you. You can write the words on your feet and decorate them with hearts, but it won't be a clear as adding the words later in a photo-retouching program. 4. Glue the toe wigs and the bow to the top of your toes using tacky glue. You can also add other details such as hats, a necklace, tie, tiny baseball hat, etc. 5. Photograph the toes. Get as close as you can with your camera and still be in focus because you want the background to be blurry. If you are using a camera you can adjust, open up the shutter as far as you can to keep the background out of focus. We used F3.5 for this picture. I'm toe-tally crazy about you! Have a toe-tally Happy Birthday! ©2016, Digital by Design, Inc. - See Copyright Information - Bloggers, if you use this craft idea or an adaptation, and link back to this page for the complete directions, let us know and we will put a link to your blog. You must follow copyright regulations. (We used the Melissa & Doug Rainbow 6 Color Stamp Pad and Center Enterprise Washable Primary Stamp Pad. They both worked well, but the Melissa and Doug ink pads aren't as big. The pads on the Enterprise inks are about 3" wide. 1. Cover your working surface with newspapers or a drop cloth. 2. Have your children press the balls of their feet onto the stamp pad and then press them on the card stock. If you are using paint, place a thin layer over a sheet of paper and have your children press the ball of their feet into the paint. ink is dry and glue them to another piece of paper. 4. 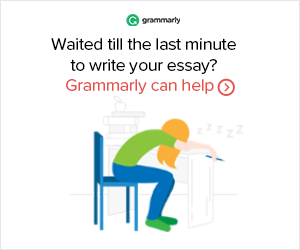 To finish have your children write a "toe-tally awesome" saying on their papers, and then add smiley faces and other embellishments. Children pick from eight different designs! Print out the cards and add embellishments. 2. I 'toe-tally' love you! - Dip your child's toes in paint or press them on a stamp pad and then press them on the card. Have your child draw faces and other features on the toe prints. 3. You're a star in my eyes! - Glue on a craft foam star or draw one on the card. Glue googly eyes on the star or draw the eyes on with a black Sharpie marker. 4. You are thumb-thing special! - Children dip their thumbs or other fingers in paint, or press them on a stamp pad, and then press them down on the paper to fill in the white areas. 7. I Love you! - Glue a googly eye over the eye and a craft foam heart, paper heart, or heart sticker over the heart shape. 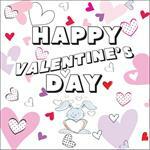 These Valentine's Day card patterns are available in color and black and white. Pick which cards you want to print out. You can print out all eight cards on two sheets of paper, or print out the same pattern, four cards per sheet of paper. Logan has been busy preparing for Valentine's Day. 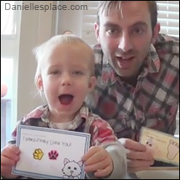 He and his dad (and their dog, Shiloh) made enough Valentine's Day cards to give to their family and friends. 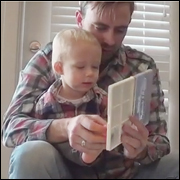 Toddlers will need lots of help completing all these cards, but the results are satisfying. Gluing, cutting, inking, placing items on the paper are all skills used to complete these cards. Watch the video on Youtube on Logan's Life. Woodsies Mini Jumbo Craft Sticks - 4.5" 50/Pkg - Use good quality craft sticks that lay flat. The 5/8" work perfect with the one-inch tape. *You can use the Woodsies Jumbo Craft Sticks with the 1.5 Inch - 3M Scotch Masking Tape for a bigger Canvas. 7. Draw out your design on the craft stick canvas with a pencil. If you make a mistake, you can erase it. When you are happy with your design paint it with the acrylic paint. When the acrylic paint is dry use a black marker to outline your shapes and write the words. You can write "I'll Stick by You Forever" on the sticks or use other sayings such as "Stick with me, Valentine", "Let's stick together", "Thanks for sticking around! ", or "I'll stick by your side." Watch a video on how to make the folding craft stick canvas. ©2012, Digital by Design, Inc. - See Copyright Information - Bloggers, if you use this craft idea or an adaptation, and link back to this page for the complete directions, let us know and we will put a link to your blog. You must follow copyright regulations. 1. Paint the inside of the tissue box black. 2. Cover the entire tissue box with white card stock (Heavy paper) using Elmer's Rubber Cement. 3. Cut a rectangle tooth shape from white craft foam. Cut the stick arms and hair from black craft foam. Glue them to the box as shown in the picture. 4. Cut the orange pompom into a carrot shape and glue it to the box. Glue on the eyes and draw eyebrows on with a black Sharpie marker. 5. Glue the white pompoms on for the feet and use black pompoms for the buttons. "My Heart Sings for You"
1. Make copies of your favorite love songs. 2. Fold the song sheets in half and cut half heart shapes on the fold to make hearts. 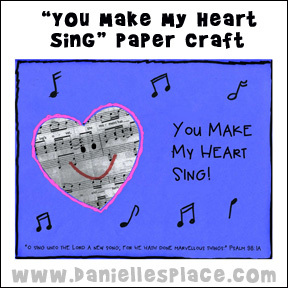 3.Glue the heart shape onto a piece of colorful paper, and write "You Make My Heart Sing!" next to the heart and a message at the bottom of the page. 4. Decorate the paper with musical notes and other doodles. 1. Before class cut a beet in half and boil it in water until it starts to get soft. 2. Print out the pattern and make copies. 3. Press cooked beet halves onto the pattern paper to make imprints of the beets. If you don't want to use cooked beets, you can just trace around the outside of the beet, or draw a beet on the paper. Write "My Heart 'Beets' for You! 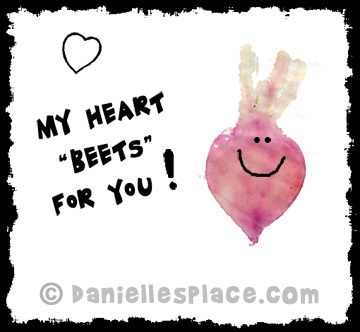 or "You make my heart beet" next to the beet print if you aren't using the pattern. You can also write "My heart (place two beet imprints on the picture) and then "for you!" 1. Cover the sides of the oatmeal box with the brown card stock. Tape it to the box with clear tape. 2. Draw the head and wing shapes from the same colored card stock. Outline the drawn lines with a black sharpie marker. Color in the eyes, nose, and feet with colored pencils. 3. 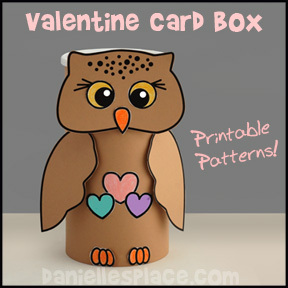 Cut heart shapes from white or colored paper and glue them to the body of the owl. 4. Cut a slit in the plastic lid with a knife so the cards can be inserted into the box without opening it. 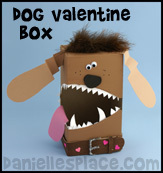 Children of all ages will love this Valentine's Day Craft! Have them write things they admire about a loved one on each key. The patterns for this craft are available to members. The back of the heart says, "You Hold the Keys to My Heart! 1. Cut key shapes and heart shapes from different colors of card stock. 2. 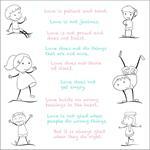 Have your children write things they like about a friend or parent on the keys and then draw a happy face on one side of the heart shape and the words "You Hold the Keys to My Heart! on the other. 3. Punch holes in the keys and the heart and string them together with a pipe cleaner. 1. Paint the entire box yellow and let it dry. You may need three coats of paint to cover the design on the box completely. Let the paint dry between each coat. 2. 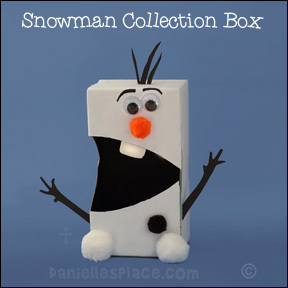 Cut the tongue, arms, hands, hair, glasses and teeth from craft foam and glue them to the box using a low temperature glue gun. 3. Cut 1 1/2" circles from white craft foam for the eyes and glue them to the box. To make the goggles cut a thin strip of brown or tan craft foam and glue it around the edge of the eyes. Cut strips of black craft foam for the goggle straps. 4. 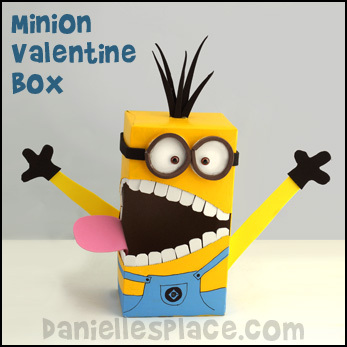 Glue the teeth and tongue to the inside of the box. 5. To finish draw the outfit with a pencil and then paint the outfit blue. When the paint is dry outline the outfit with a black marker. 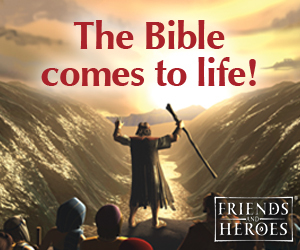 We would love to see your minions. If you make a minion, send us a picture and we will put it up here. 1. Cover the entire oatmeal box with white paper using clear tape of glue. 2. Paint the penguin pink leaving the stomach and face white. 3. 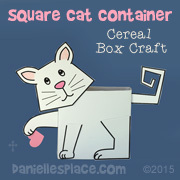 Draw wings, beak, eyes, and feet onto card stock, paint them, cut them out, and glue them to the oatmeal box. 4. Paint the paper bowl, glue a pompom to the top, and then glue it to the lid of the oatmeal box. 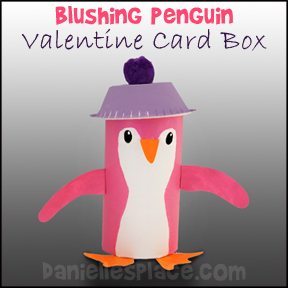 Children remove the hat to insert their Valentine's Day cards. 1. Print out the pattern and make copies. 2. Have the children color the bugs body, hands, and boots and cut them out. 3. Cut out heart shapes for the wings and feelers. 4. Cut pipe cleaners for the legs and tape to the back of the bug. 5. Glue the back of the bug's body onto the front to cover up the pipe cleaners. 6. Tape pink hearts on the back of the bug for wings and tiny hearts at the end of the bug's feelers. 7.Glue or tape the boots and hands to the ends of the pipe cleaners. 1. Before class print out the bear card pattern and make copies. Print out the rabbit patterns and cut the rabbits out. 2. In class have the children color the cards and the rabbits. 3. Cut a slit in the heart and slide the rabbit into the heart. 4. 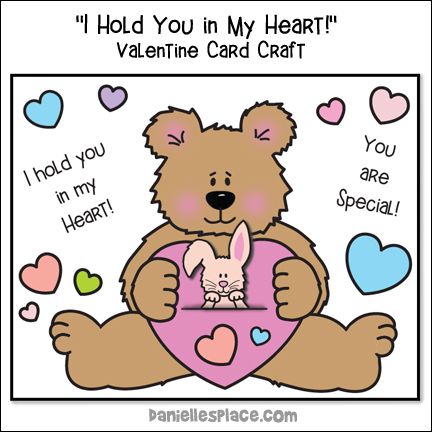 Glue the card onto a piece of construction paper, but don't glue too close to the rabbit so that he can be removed from the heart. 2. In class have the children color the windsock. 3. When they are finished have them tape or staple red and pink crepe paper streamers onto the bottom back of the pattern. 4. Roll the pattern up and staple the ends together. 5. 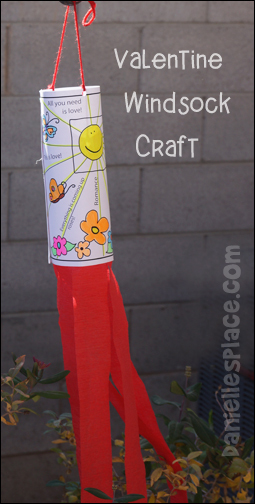 Punch a hole at the top of the roll on opposite sides and tie yarn to make a loop to hang the wind socks. 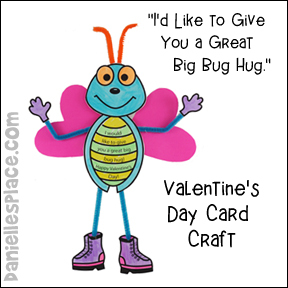 These cards from Memory Cross Inc. are a great way for children to spread the Word on Valentines Day. 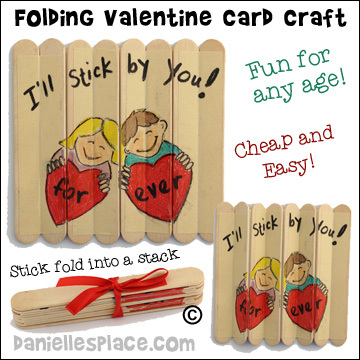 You can find more Valentine's Day Crafts on the Valentine's Day Crafts Page 1. Little Critter: Happy Valentine's Day, Little Critter!